Carpets and rugs. Most people like to admire them. I, on the other want to own every one of them. I especially like the ones of Turkish origin and from Uzbekistan. So I wanted to share two new movements from the rug world, because until recently I have not known about it or saw it anywhere except when I went to one of my carpet shopping sprees in Samovar of AlTilal. The first, which I have already mentioned before, is the patchwork carpets. 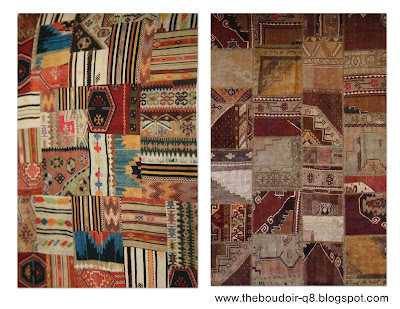 Basically, they're cutouts from different rugs/carpets knit together in to one whole carpet. The other is called Color Reform or reworked vintage carpets. Vintage carpets that have lost their color over time would be dyed with bright striking colors. These two ideas can come together to create a patchwork color reform carpet. I think it would be wise NEVER to get rid of any old carpet you own, and it is a known fact that the more worn out or older a carpet gets, the better its quality! And if you ever get bored of an old one or just want to replace it, you can always create one of these two modern remakes of carpets (ofcourse with the help of a professional or DIY). OHH i HAVE ONE OF THOSE..IT IS LOVELY..I FEEL GOOD LOOKING AT IT, SO OLD YET SO NEW! i love the purple and the pistachio , i never knew !!! , we have alot of old vintage carpets that we dont know what to do with !! i can give them my carpet to fix its color? You know what would be cool? Dyed vintage rugs sewn together like a patchwork carpet. I've never seen one, but I sure hope that that becomes trendy in the near future. It would also entail a lot of work, but at least we've made something fresh in the eyes.